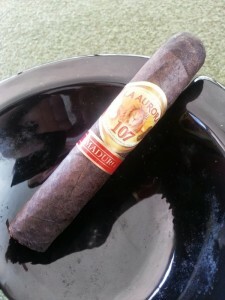 I recently was given the chance to try the upcoming La Aurora 107 Maduro….so, of course I jumped at it with both feet. 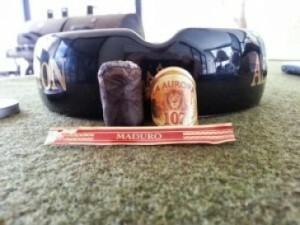 I’ve taken great enjoyment from La Aurora cigars in recent years, in particular with the 107, so I had great expectations from its maduro sister blend. 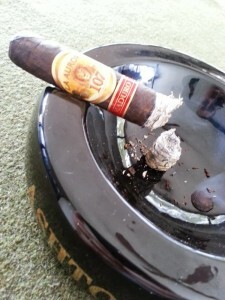 The 107 was originally released in 2010, to celebrate La Aurora’s 107 year history, and rumblings of a maduro version have made the rounds in the intervening years. Well, this is the year – the 107 Maduro were released in limited fashion to TAA members at their convention earlier this year, and will be launched nationwide at IPCPR 2013 in Las Vegas this summer. It will be available in 4 sizes; Corona (5.5X43), Robusto 4.5X50), Toro (5.5X54), and Belicoso (6.25X52). MSRP will match the existing 107 line, ranging from $6.60-$8.80. The blend consists of a Nicaragua/Dominican filler blend, bound by Dominican Corojo and wrapped in Connecticut Broadleaf. I was provided three samples of the 107 maduro, two of which were smoked in writing this review. Prelight, the broadleaf wrapper is quite dark and evenly colored, which works well to obscure the seams. The construction is flawless from all appearances – it is firm, with no soft spots and no noticeably over-dense areas. The wrapper provides a faint barnyard or hay aroma, while the foot is remarkably sweet and earthy in character; perhaps a little leather peeks through as well. After a quick clip, the cold draw reveals a pronounced chocolatey sweetness, with just a bit of a spicy punch on the lips. The resistance is just about perfect – deliberate but not too free; in the goldilocks zone for my preferences. The initial puffs during the first five to ten minutes of smoking provide a great deal of peppery spice. It is noteworthy that this spice is experienced more nasally than by taste initially. The finish, however, is where it really presents itself as a flavor. To me, it is more a cayenne/moderate red pepper flavor than the tropical spice I have noted in other cigars. In any event, it is quite pleasant, even for a capsaiphobe such as myself. I never felt overwhelmed, even at the height of this spice, which had settled considerably by the 20 minute mark. The burn at this point has been very straight and maintenance free for both cigars used to formulate this review. I noticed in the early portion of both the cigars that they produce voluminous amounts of smoke. This continues into the midsection of the 107 maduro, which I happen to appreciate. There’s never a doubt as to the fact that this little guy is lit. The burn continues in its previous perfection during this portion as well, not requiring so much as a touchup. The pepper has taken a distant backseat by this point, and some of the earthy sweetness noted prelight has begun to present itself nicely. If you are really into the pepper, it can still be found prominently on the retrohale. Retrohale also presents a beautifully moderate cedar flavor accompaniment; it’s tough for me to decide which is more pleasant – the sweet flavors of the finish, or the cedary spice with retrohale. Both are very entertaining. I had to remind myself to mind my cadence a number of times so I didn’t overheat it in my greed. The strength of the 107 Maduro really picks up during the final stretch, although it never becomes a “kick you in the pants” powerhouse. Overall, I’d place it on the heavy end of the medium range in this respect, or on the lighter end of the full-strength spectrum. I find the flavors in the final run to have somewhat rearranged once again, with the chocolate sweetness coming front and center. I say rearranged intentionally – the 107 Maduro seems to migrate through an established range of flavor ratios, rather than progress through myriad different flavors; the ratio of this core flavor palette just seems to flit about to provide an enjoyable experience throughout. Even nearing the end of the cigar, I have to admit that I never got the slightest hint of harshness. The only hint that it was time to put it down came from the ashline approaching my fingers. Haven’t had the maduro yet, but did just smoke the original 107 and was wondering what vitola was it? My knee-jerk was to think that it was a lancero but I don’t know if those were even ever available. Looking forward to trying the maduro.